If you ardently follow the above best practices, you are less likely to fall into a monthly debt trap. However, if you haven't planned your expenses earlier and are already facing month-end cash crunch, how can you get back the cash flow? Will you try to borrow from a friend? 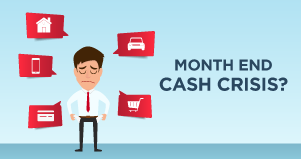 Let’s face the hard truth – no one likes to lend money during a month-end for similar reasons. If you cannot borrow from a friend or family, it’s quite natural for you to feel challenged by a month-end cash crunch, particularly when you have an unexpected bill to clear. As a next option, will you turn to your bank for a short-term personal loan? You can, provided you have the time to wait for the traditional loan procedure, which is subject to documentation and credit checks. What if you do not have a credit score because you have never taken a loan before or have a rather low credit score, but need urgent cash? Well, your worry ends here. 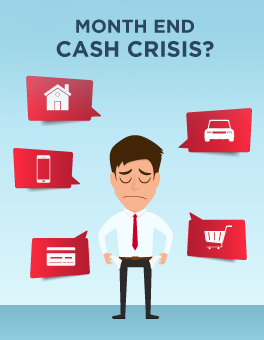 You can now get an instant cash loan from CASHe without any credit checks to meet that urgent expense instantly. What is CASHe? CASHe is NBFC One Capitall as well as Bhanix Finance and Investment Limited’s FinTech platform for giving instant short-term personal loans to young salaried professionals of the millennial group. The CASHe personal loan app is available on Play Store for Android and App Store for iOS smartphone users, respectively. You can key in the CASHe keyword to download the CASHe app on your smartphone. CASHe can provide financial assistance of up to INR 1,00,000 in the form of an unsecured personal loan for 15, 30, 60, 90, and 120 days depending upon your short-term personal loan needs. The company provides unsecured personal loans for as low as INR 5,000 with affordable interest charges and you can get an instant loan credit in minutes to solve your mid-month or month-end cash crunch problems. Learn more about CASHe and its happycustomers for an uninterrupted cash flow even during the month-end and enjoy your financial peace.